It is important and critical to ensure the safety of staffs and visitor that entering factory area especially in the unexpected event of a fire. In Dec 2018, Safety, Health and Environment team was conducting fire drill to raise awareness about the evacuation procedure and assembly point in the event of a fire. All staff were evacuated out from production floor, store warehouse, testing lab and office within 8 minutes. Besides that, SHE team also explained the type of fire extinguishers and demonstrated how to use a fire extinguisher. Daikin Refrigeration Malaysia is certified as Green Heart Factory. 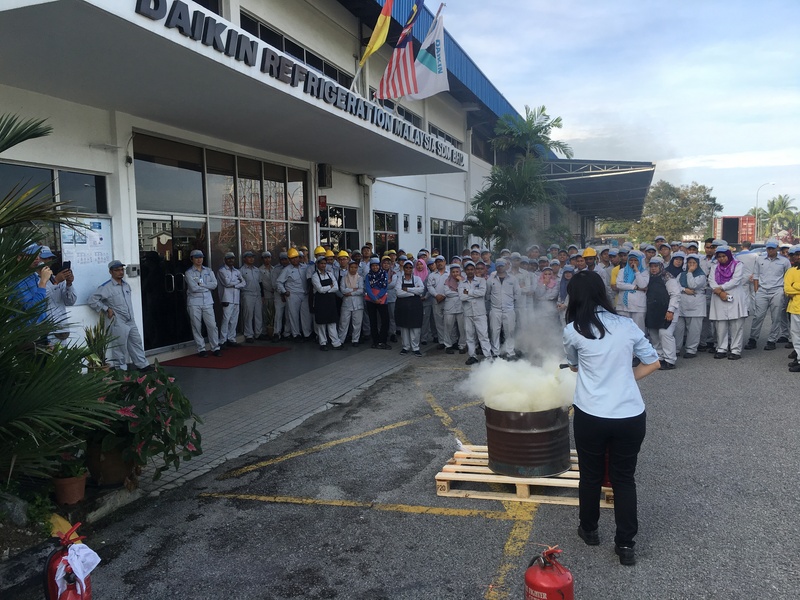 It is important and critical to ensure the safety of staffs and visitor that entering factory area especially in the unexpected event of a fire. In Dec 2018, Safety, Health and Environment team was conducting fire drill to raise awareness about the evacuation procedure and assembly point in the event of a fire. All staff were evacuated out from production floor, store warehouse, testing lab and office within 8 minutes. Besides that, SHE team also explained the type of fire extinguishers and demonstrated how to use a fire extinguisher.